Oerlikon Leybold Turbo Molecular High Vacuum Pump Turbovac 151 C Fabr. Nr. 85635 . New Life Scientific, Inc. 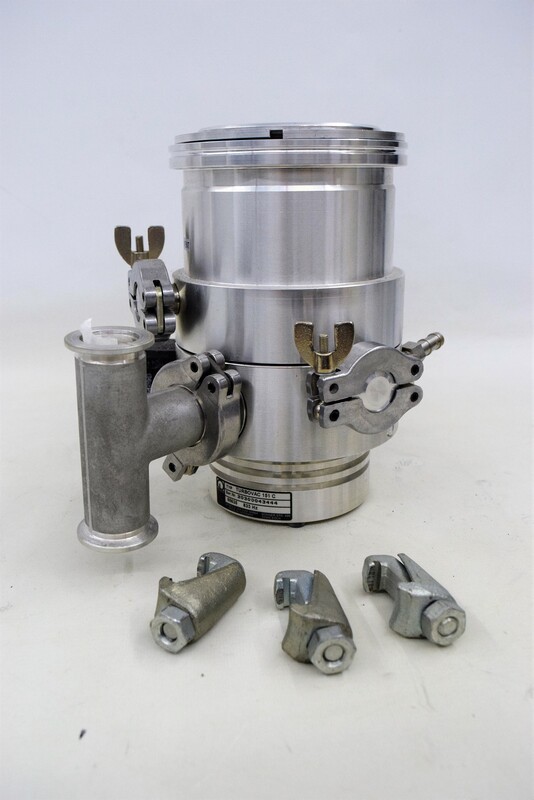 This vacuum pump is in excellent cosmetic condition with very little wear and it has a stainless steel body. This vacuum pump is a space saving device, permanently lubricated bearings and oil free for generating clean high and ultrahigh vacuum conditions. Although this pump is untested, it is still protected by our 90-Day warranty. Our in-house technicians did a visual inspection of the equipment and commented on how it is in excellent condition. In addition it will come with three mounting clamps as pictured. The Oerlikon Leybold Turbo Vac 151 C Version turbo molecular high vacuum pump has a pumping speed of 145 liters per second (l/s). The inlet is 100 CF (Conflat 6 inch) with a ISO KF-25 exhaust foreline flange and a ISO KF-10 vent port. The Oerlikon Leybold Turbo Vac 151C Version turbo molecular pump can be used for pumping aggressive or reactive gases. The C Version of this pump contains a purge gas facility for aggressive gases; this protects only the bearing area and the motor of the TurboVac 151 C Version.